Hand-held portable unit. Strip cutter for plastic laminates and veneers. Quick and easy to use. Obtain a clean and splinter free cut with no waste. Cutting thickness can be adjusted with a micrometer. 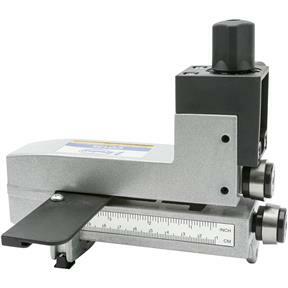 A metric and inches scale can be used for easy adjustment of strip width. The new and improved metal bracket made of a special alloy provides stronger hold and stability for the guide fence. The fence is also bolted at both ends for extra strength. The unit is also equipped with a special lock knob assembly for a tighter locking metal bracket that holds the fence. 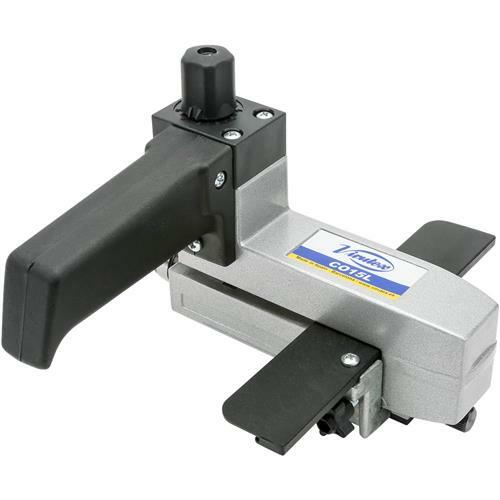 Micro metric fence adjuster will assure you a very precise positioning. It will also lock the fence into a very tight position. Any pressure from the operator will not move the fence out of alignment.